It was in this spirit that we approached starting the rehearsal studios in the first place, and most recently propelled our involvement with the SoundSwell project. Back in August of 2012 I read an article on Hypebot about the Iowa City Public Library and how they were offering free downloads of local musicians for those with a library card. I couldn’t help but think that if they were doing it in Iowa, we could do it here in Santa Cruz. I tweeted as much to the Santa Cruz Public Library and the next day got an email from the virtual services coordinator. She was aware of the ICPL work and was also about to attend a leadership retreat the next month which included the development of a year long project for which she would get help applying for grant funding. We got to emailing, she got to talking around her office and before you know it, we started to make something happen. Serendipity? It was through this one interaction that we opened the door to being involved with this amazing project from the ground up. To date the Santa Cruz Public Library has paid local musicians over $5000 to license music for library patrons to download free of charge. This year they have another $4000 waiting to distribute to new local bands what would like to join. This project is a win / win. Local musicians get real money in the bank ($100 for full length LP, $75 for EP). To earn that much from iTunes band would typically need to over 100 downloads. 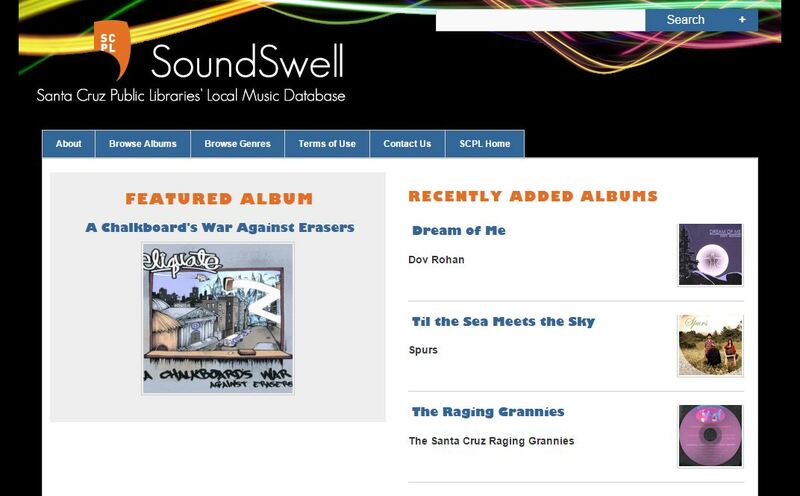 With SoundSwell, bands not only make the money up front, but only local library patrons can download the music, so bands are not only earning money, but also making new local fans. Our community also gets access to a library of free local music. All it took was one tweet to make to make the connection to start this project. I encourage you to send one email, or tweet, dedicate a FB post or an Instagram hashtag to foster more SoundSwell connections. Attention all Santa Cruz musicians. Our library system is amazing and is ready to pay you to make your music available via download with an Santa Cruz Public Library card. Read all the details below. Get your paperwork and CD in ASAP in order to be included! The SoundSwell team is looking forward to working with you on our local music database project. The library has always been a place where people can find music, movies and other materials for entertainment and enrichment. Other libraries across the country are starting to incorporate local music into their systems and with our thriving music scene, we thought it would be a great fit in Santa Cruz as well. Our hope is that it will be win/win for you and our library patrons. Ideally in addition to monetary compensation, we would like to help expose more people to your music and convert more fans, while helping our patrons diversify their local music collections. 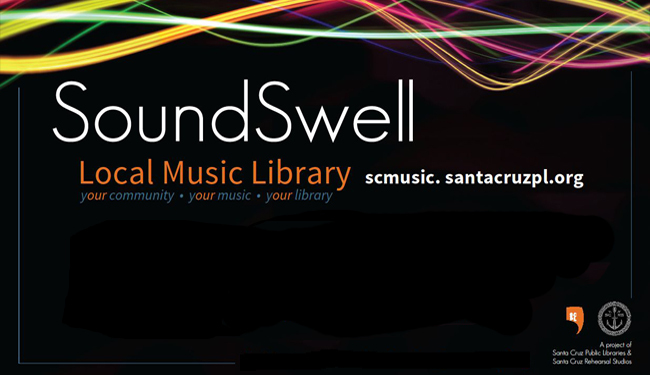 The SoundSwell project is supported by a Library Services and Technology Act (LSTA) Eureka! Grant. The grant funding period covers most of the cost for licensing for the initial test database, which should be completed in August 2013. Under the licensing agreement, the library will pay you for a 2 year license as follows: $100 for a full length LP consisting of 9 or more songs, $75 for an EP consisting of 6-8 songs, and $50 for an EP consisting of 4-5 songs. During the term of the license, only those users with a valid library card will be able to download licensed songs. To raise this much revenue from iTunes, you would typically need 100 people to download one of your songs. If 100 people download your song from SoundSwell, you could gain 100 new local fans. That’s 100 people living in Santa Cruz who might tell a friend about your music or attend a show! 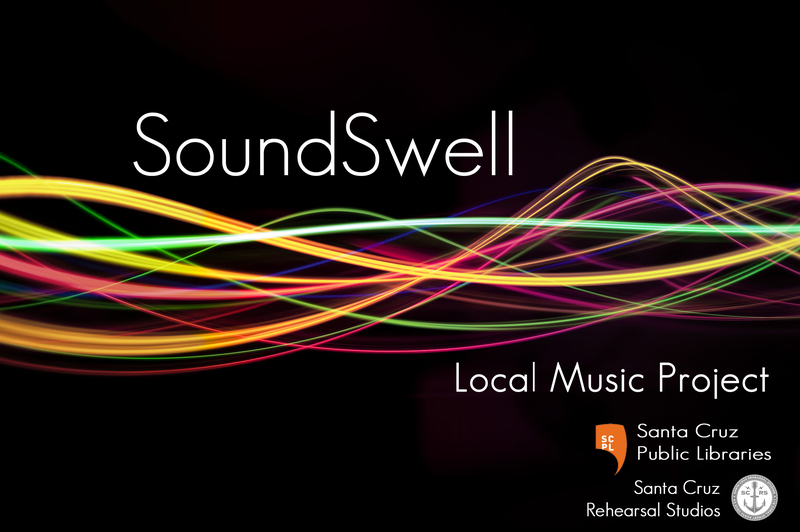 Another goal of the SoundSwell project is to establish a historical archive of the local music of Santa Cruz County. Although this aspect of the project will not be implemented until the database has been well established for at least a year, we believe that preserving this aspect of local community identity is important. That is why we ask in the license agreement for your permission to use your album in perpetuity in the archive. This archive will be streaming, but the music will not be available for download. Both the downloadable database and streaming archive will display live links to your band’s website or Facebook Page, making it easy for new fans to connect with your band, your projects, and your performances. To receive a licensing agreement to review, sign and return email Jennifer at jenn@santacruzrehearsalstudios.com or Diane at cowend@santacruzpl.org . Please let either of us know if you have any questions or concerns or would like to meet in person to go over any aspect of the agreement prior to signing. Once fully executed, we would need you to deliver your CD to the library office downtown no later than one week, at which point the library will mail you your agreement fee. Make an appointment with Diane Cowen to deliver the agreement in person or send the agreement with your original signature and W-9 form via US mail. Once the agreement has been received and signed by the library Director, the document will be scanned and emailed back to you with both signatures for your records.